I think it's probably obvious who this post is aimed at. This is what happens when I'm left to my own devices. there's an adorably cute species to counterbalance it. Meet the quokka; possibly the world's happiest animal. Seriously, they don't stop smiling, even when they're asleep. 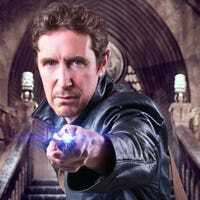 Has anyone been listening to Big Finish and Audio Go's Destiny of the Doctor series? I marathonned most of the episodes while I was in Germany, and have been listening to the Ninth Doctor one this morning (not quite finished it yet). I'm going to meet my favourite Doctor! Aaaaaah! Welcome to the galaxy, Everest Hobson Lucas! George Lucas and his wife Melody Hobson have just had their first biological child. That's quite a brave undertaking for a man of 69 years old, but I'm sure he'll have the support of his three adopted kids, who're all over 20. Reasons to be happy, please! New Doctor Who 50th Anniversary pictures!